As we all know that tourism management is the World’s fastest growing sectors so there exist diverse opportunities in the field. The tourism industry of India is dependent on national as well as foreign tourists who travel across different part of the country. 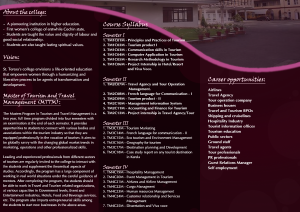 The Masters Programme in Tourism and Travel Management (MTTM) is a two-year full-time programme divided into four semesters and there shall be an examination at the end of each semester. It provides opportunities to students to connect with various Bodies and Associations within the tourism industry in such a way that they are equipped professionally in the vocation of tourism. It aims to be globally savvy with the changing global market trends in marketing, operations, and other professionalized skills. The course focuses on aspects like personality development, handling and controlling the tourists and providing them with the required help in specified region. 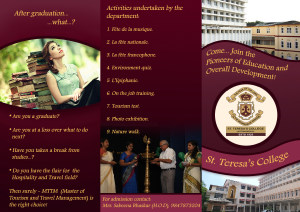 Leading and experienced professionals from different sectors of tourism are regularly invited to the college to interact with the students and supplement the theoretical aspects of studies. Accordingly, the programme has a large component of working in real-world situations under the careful guidance of mentors. After completing the program, the students should be able to work in, travel and tourism-related organizations, at various capacities in government levels, Event and Entertainment industry, Hotels, Food & Beverage services etc. The programme also imparts entrepreneurial skills among the students to start new businesses in the above areas.